This is an Exterra station with live actives termites inside. 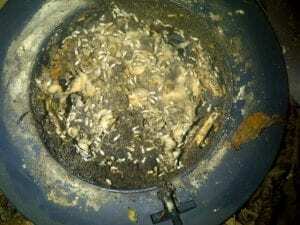 Unless experienced with Termite Identification You won’t notice but the Worker Termites have become a lot whiter in colour, this is a sign of the requiem intoxication, a sign that the termites have consumed the bait. This is now working to eliminate the colony over time – Baiting should occur till colony elimination takes place.